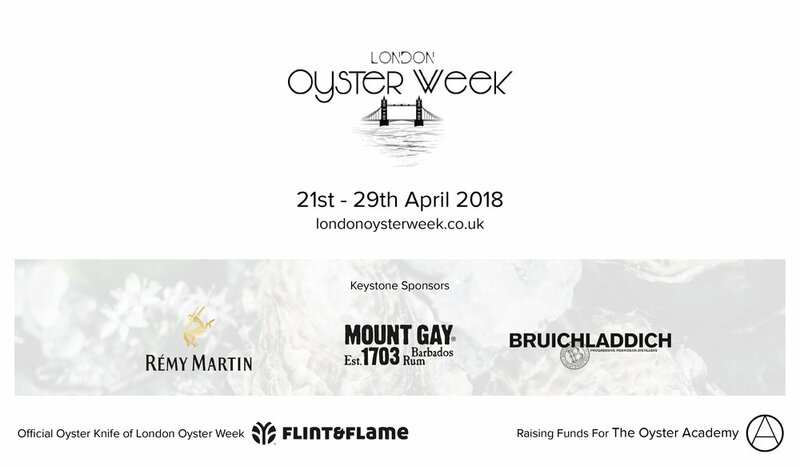 I'm excited to share that I have been very busy offline, organising the inaugural London Oyster Week event for this coming April. We have had such a positive response to the idea inspired by the brilliant work done at events like London Cocktail Week produced by Drink UP London. The format works really well to get maximum involvement from venues and oyster bars without them having to leave their premises. We promote oysters in venues for venues and for oyster farmers. What is happening at London Oyster Week? The Oyster Passports also give holders preferential rates at the Feature Events held at selected venues, this will include events like the 'Oyster Atlas' where we attempt to get the most 'merroirs' under one roof with as many of their farmers as possible there too. You get to eat as many as you want for the one ticket price. Plus, there'll be drinks on hand from the wonderful official sponsors of London Oyster Week, Bruichladdich Whisky, Remy Cognac and Mount Gay Rum. We will also be raising funds for The Oyster Academy International and its work in oyster advocacy, industry and oyster restoration support projects. This will be via a discretionary donation on bills throughout the month of April in participating restaurants. This is a fantastic show of support for the oyster industry. And speaking of, the oyster industry is collaborating beautifully for this event with suppliers donating oyster stock to assist our fundraising efforts. It is great to see such a holistic approach to an event benefiting so many sectors, as well as having a lot of fun. There will be more news coming soon, so sign up at the website to keep in the loop for breaking London Oyster Week updates and events. In recent times I've seen some top journalists and foodies (no, I am not going to mention names) getting their Rocks and their Natives confused. This might not seem like a big deal, but imagine going in to a restaurant and somebody, perhaps even the waiter or waitress offering you a wonderful Beaujolais which is in fact a Sancerre!? Its sounds crazy, particularly as the former is red and the latter is white, but for those of us embedded in oyster culture, the Native and the Rock are just as distinctive.. I understand the confusion when an oyster has been grown in this country, people may be forgiven for believing it to be a native species. However there is only one Native oyster in the British Isles and it is Ostrea edulis. Calling anything a Native on a menu is going to cause problems in our global society; a different oyster in another country, can just as easily be called a Native on the daily specials chalkboard. So how do you know what you are getting? To add to the mystery, this enigmatic oyster is also referred to with numerous other names dependent on its species description, appellation and appearance. Everyone calls it the Native, the French call it the Belon, the Pied de Cheval and 'l'huître plate' . The Americans call it the European Flat, or the Belon (Maine) or other area of growth. Now by rights, an Ostrea edulis should only be called Belon if it comes from this particular river in Brittany, France; The Belon River. But this name that is a result of origin has been adopted as a generic label in the States. Strangely not here, just a channel hop across from origin, this is perhaps because we have had a true Native of our own for just as long. Historically courting controversy; in the World Register of Marine Species (WoRMS) there are 19 unaccepted names for this oyster species put forward by scientists over the last three centuries, ranging from Ostrea adriatica to Ostrea cristata. If this is all becoming increasingly muddy, a sturdy starting place is to begin with the accepted species name. Ostrea edulis is indigenous to this country and others but It has been naturalised elsewhere; much like the Rock oyster here in the UK which originally came from Japanese waters and is known as the aforementioned Rock, Pacific or officially Crassostrea gigas. Because this Rock oyster now grows here in the UK, very successfully, many people refer to it as a native oyster on menus and social media posts. This can make the above discussion step into a whole other species of confusion. Rock oysters are only native to Pacific waters but can be found around the world as they have been introduced and naturalised. Essentially, because latin names are too much of a mouthful to be concerned with when you are already considering filling your mouth with the more appetising bivalves, the best way is to label an oyster with its 'appellation' or place of growth and harvest. The differentiator between the two species usually sits, for simplicity with Rock and Native. So, for example you would get a Porthilly Rock Oyster or a Menai Rock Oyster and you'd get a Loch Ryan Native Oyster and a Galway Native Oyster. Often, with the Rocks, because the farm only produces this species, the 'Rock' will be dropped, as you'll see in the titles of my oyster profiles. So to confirm, there are only two species of oyster growing in the British isles and they are generally referred to as Rock and Native. The picture above shows the very distinctive differences. I hope you enjoy eating them wherever you are and whoever you're with. Let me know how they taste and if you are a media professional who wants to know more, keep an eye out on my events page for a special workshop I'll be doing with the Guild of Food Writers. Sharing the #oysterlove - Katy. This beautiful dish was an invention of mine when I was asked to step in last minute to do a second chef demo at Padstow Xmas Festival. The 4 basic ingredients for this scrumptious dish. I'd already presented my prepared dish in an earlier demo so had to think quick for some fresh 'content' for the audience. I'm not sure where it came from but I grabbed these ingredients and cooked this dish for the first time, live on stage. It's become a bit of a winner, especially for convincing oyster doubters to become oyster lovers. The name 'Carmauroli' is the conjugation of three lovely Italian ladies names I know who love food and adventures. A great combination. Shuck and strain your oysters, according to preference of how pale and creamy coloured you want your sauce you can carefully trim the dark gills and save for frying in an omelette. Blend the oysters with good quality rapeseed oil using an emulsifying blade if you have one, otherwise pulse setting on your food processor should work fine. Cut up the bacon and fry gently until nice and crispy. Boil the pasta until al dente, strain and return to the hot pan, mix in the crispy bacon then stir in the oyster sauce, coating all the pasta with it. Serve and season with black pepper and a sprig of Basil.